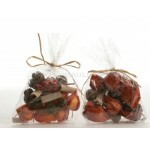 Lumineo Natural Decorations Pinecones and Berries Natural Materials Mixed Pinecones & Berries Sold in Single Packets .. 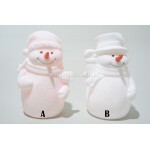 Ceramic Toy Store Tealight decoration Approx size (w)14cm x (h)15cm x (d)11cm Tealight NOT included (See product code 482267 LED Tealight) ..
Christmas Theme Vinyl Window Stickers 3 Per Sheet 3 Vinyl window stickers per sheet Peel off and cling to glass Easily removed No adhesive Choice of 4 sheets ..
Deco 7.5cm Clear Acrylic Snowflake. 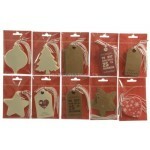 Deco 7.5cm Clear Acrylic Snowflake. 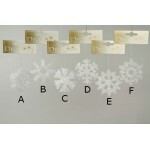 7.5cm Clear Acrylic Snowflake 6 Avialable Options Perfect for hanging inside and outside the house. 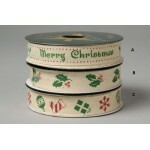 Hang from trees, windows and porches to add a festive sparkle Comes complete with hanger ..
Deco Canvas Christmas Ribbon Cream printed canvas ribbon. 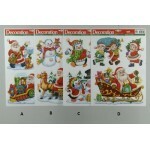 Available in 3 styles. 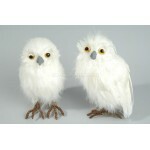 1.5cm x 2.7m ..
Deco White Feather Snow Owl Decoration White Feather Snow Owl Decoration Perfect for either hanging or standing amongst the branches on the christmas tree. 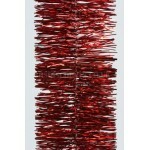 Has a hanging loop and also wired feet. 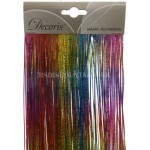 Size approx: 14cm high ..
Decoris 2.7mtr Tinsel Garland Tinsel Garland Shiny 4 ply 75mm x 2.7mtr Colours available: RED - GOLD - SILVER - CLAY - HEAVENLY BLUE ..
Decoris 5" Colour Changing LED Snowman Choice of 2 Designs Colour Changing LED's Approximately 5" / 13cm Tall Batteries included On / Off Switch ..
Decoris 6cm Wired Glitter Leaves Add the final touch to your Christmas wreath, tree or home made decorations. 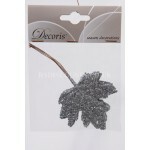 6cm Wired Glitter Leaves Available in Red, Silver or Gold Wired Stems 4 Leaves Per Pack ..
Decoris Classic Christmas Gift Tags 10 Different Designs Natural Gift Tags ..
Decoris Multi Coloured Shiny Lametta Tinsel A fantastic decoration for your Christmas Tree Also known as angel hair or lametta! 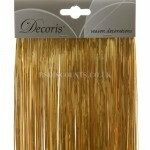 ..
Decoris Ocre Gold Coloured Shiny Lametta Tinsel A fantastic decoration for your Christmas Tree Also known as angel hair or lametta! ..